Today’s edition of Nibcrom Lives is the final comic of the series. I’m proud I kept this going for eight years without missing an update. I’ve learned a lot about writing and drawing, and I’m happy to see how far my art has come. I’m also excited about where my art could go in the future. I want to thank my brothers John and Pete for letting me use their names and likenesses for Nibcrom Lives. Hopefully I didn’t embarrass them too much. I want to thank my wife Annie for all of her support. She was the one that encouraged me to start Nibcrom Lives shortly after we got married. She was the one that encouraged me to keep writing and drawing over the years. She was the one that allowed me to start up a second comic strip only months after our first child was born. And she was the one that supported me updating Nibcrom Lives three times a week, even after we had just learned we had a second child on the way. I also want to thank everyone who has read the comic, whether you have read it from the beginning or if you just found out about it. Thanks to everyone who gave me feedback on the comic, through email or on social media. 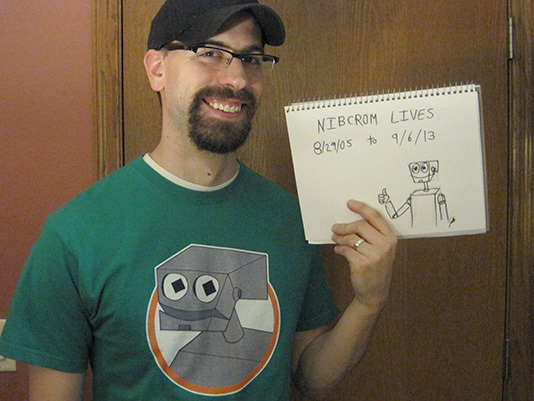 Thanks to everyone who shared Nibcrom Lives with a friend. Thanks to everyone who bought a piece of merchandise. The comic Nibcrom Lives is over, but there will be other blog posts on this site at some point in the future. In the meantime, I’m still going to be posting new comics every Monday over at Stuck in Reverse.